I get many questions about Keurig Vue and Vue pods, so today I’m going to answer a few of them. This post was originally published in 2013. The Vue system has been discontinued in August 2014. Right now there are 7 Vue pod varieties still available for purchase at keurig. com, and you should also be able to find Vue pods on Amazon. Luckily, there’s also a Vue adapter ($14.99) which allows you to brew your own coffee and regular k-cups in your Vue machine. If you’re looking for the latest Keurig model, here are the best Keurig coffee makers right now. Keurig Vue works exclusively with Keurig Vue cups. The Vue cups have number 4 on the label and they cost from $0.68 to $0.90 per pod. What are Vue cups? Vue cups are coffee pods originally designed for Vue machines. The Vue machine was discontinued but Keurig still makes Vue pods because they work with both, Vue machines and Keurig 2.0 system. Vue packs have two layers – plastic cup and filter with coffee. There’s a free space between them Keurig uses this empty space to redistribute water pressure and air differently, which results in richer and slightly frothy drink. Vue cups are made of #5 plastic and they are recyclable. To recycle your Vue cups, first, allow the pod to cool, then carefully peel back tab to separate foil lid and any filter from the cup. Recycle your cup wherever #5 plastics are accepted. Best tasting Vue cups? If you like your coffee really strong I recommend Dark Magic and Starbucks French roast. If you like medium coffees, Donut Shop and Newmans Own are my favorite ones. All these Vue cups will also work in Keurig 2.0 coffee maker. Can you use k-cups in Vue? Even though k-cups don’t normally work in Vue machines, there’s a special Keurig Vue adapter ($14.99) you can use to brew regular k-cups or your own coffee in Vue. The adapter/ reusable Vue cup works with all Vue models: V700, V600, and V500. Best grind for Keurig Vue reusable cup is the medium grind level. Vue cups vs K-cups, the difference between the two? The main difference is the pod shape and how it works. The k-cup is punctured from the top and bottom side and the water goes directly through the k-cup. The Vue pack has one additional layer and free space between layers. Keurig uses this empty space to redistribute water and air differently and that why coffee tastes slightly better and can have a nice foam on top. While the k-cups are not recyclable, you can recycle Vue cups. Can Keurig Vue do espresso? No. Even though Vue has air infusion system that gives nice, frothy drinks, it can’t do espresso coffee. Keurig has just released the K-Cafe model which makes a concentrated brew and has a built-in milk frother so you can make lattes and cappuccinos at home. Here you can read Keurig K-Cafe review. Where to buy Keurig Vue cups? Keurig said that they will officially discontinue all Vue pods in July 2018, but you can still find few pod options online. There are 7 Vue pod varieties available for purchase at keurig.com, while you can still find most flavors on Amazon. As far as the operation and simplicity, the Keurig Vue is very similar to a classic k-cup machine. You just take the Vue pod, insert the pod in the machine, close the handle, press the button and your coffee is ready in less than a minute. The touchscreen on this machine is super simple to use. It offers three main drink options: coffee/tea, brew over ice and cafe drinks and you just need to choose the one you want. You can also adjust the temperature of your drinks, within 187 ºF and 197 ºF range (the default temperature is 192ºF). 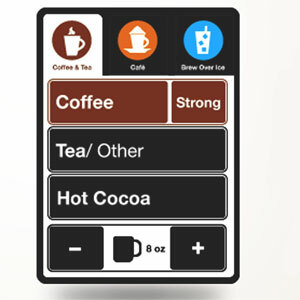 For coffee, you can set the desired strength, by choosing a regular/ strong option. Choose a cup size: 4, 6, 8, 10, 12, 14, 16 or 18 oz and press brew. For cafe style drinks you need two pods. Choose cafe option, then make the froth. The Vue makes 4 ounces at froth setting. Then, insert the second pod. Choose coffee or tea and cup size (this will be added to 4 ounces of milk) and press brew. It’s really easy. It seems that they don’t make the cafe style pods anymore. 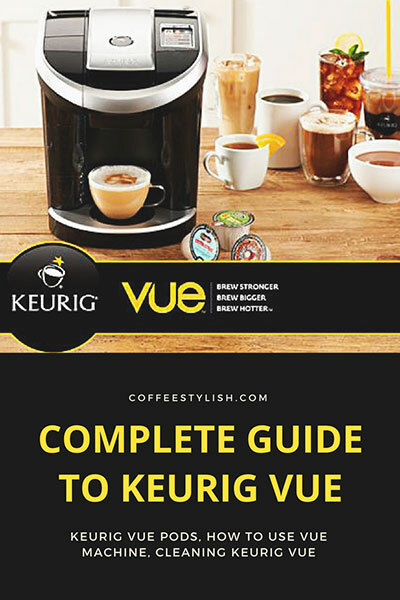 To see full instructions, download Keurig Vue manual here: Vue V500 manual, Vue V600 manual or Vue V700 manual. I recommend to do a regular cleaning routine every two weeks and to descale your machine every 3,4 months to remove calcium deposits. This will keep your Vue nice and clean. 1. Turn off the brewer. 3. Hand wash all the removable parts with mild detergent and dry with soft cloth. 1. Empty the water from the water reservoir and remove the water filter. 2. Make sure the auto on/off is disabled. 3. Pour 1 bottle of Keurig Descaling solution and 14 ounces of water into the reservoir. Place a mug/pitcher on a drip tray and insert a clean empty vue cup. Close the handle and press Brew. Wait until the solution is dispensed. Discard mug contents. 4. Repeat the brewing process until the brewer indicates “add water”. Let the brewer stand for at least 4 hours. Do not turn off the machine during this period. 5. After 4 hours, remove and empty the water tank and rinse well. Remove the empty Vue cup too. 6. Fill the reservoir with clean water only and again, place a mug or a pitcher on a drip tray. Press brew button to rinse. Repeat brew step until you empty an entire reservoir then refill again with fresh water only. You want to completely rinse the machine and make sure there’s no residue or smell. Two full tanks should do the job. 7. Wipe the machine with a damp cloth, rinse all removable parts (see regular cleaning routine), fill the reservoir with clean, fresh water and you’re ready to brew. The Keurig Vue includes a limited one-year warranty for normal home use. To keep your Vue in good shape, it’s recommended to clean the external parts or the brewer regularly and descaling it every three to six months. Customer service help is available 7 days a week at 866-901-2739. Vue V700 replacement water reservoir and a drip tray. The V700 water reservoir will also fit your Vue V600 machine. They are the same size and capacity, the only difference is the color, but you can simply put on the lid from your old reservoir. If you cannot find the part you’re looking for or you need a replacement reservoir for your V500, please contact Keurig Customer Service. Send them your machine’s serial number and they will help you find the correct part. Also, I’ve been getting emails asking about the Keurig Vue Recall. There is NO OFFICIAL RECALL NOTICE FROM KEURIG and their Vue brewers are perfectly fine. They simply don’t sell Vue machines anymore. The only recall notice so far was for their MINI Plus brewers with model number K10 produced prior to July 2014. For more details, please contact Keurig Customer Service. Let me know if you have any other concerns or need any help in the comments below. I would be glad to help! If you’re trying to reduce exposure to chemicals in plastic as much as possible, these are my favorite plastic-free coffee makers. It’s a shame that you spend money on products that get discontinued, and now you have to buy an adapter for it to work with the Kcups. I’ll be replacing this keurig vue with a non keurig product. Disappointed customer. Hi John, I am sorry that you’re having issues with your machine. Unfortunately, I don’t think this is something you can easily fix on your own (when this happens it’s usually because the screen is broken), so I recommend to call Keurig Customer Service at 866-901-2739 for assistance. You can unplug and plug in the machine to see if it will help, but I doubt it. I need to find the serial number for my Vue coffee maker but cannot find it anywhere. None of the suggestions on the Keurig website are helpful. Is the serial number on the machine? Hi Allan, you should be able to find the serial number on the left side of the brewer once you remove the water reservoir. Thank you! I’ve found it. I have a Keurig 2.0, iuse filtered water exclusively. A friend advised me that I should clean & sanitize the resivour and the water mechanism daily to prevent contamination from bacteria and mold etc. Sounds like overkill to me, what do you recommend? I agree there is no need to sanitize your machine every day. I do recommend to quickly rinse the water tank every morning and fill it with fresh water. No need to use detergent, just to quickly rinse it with water. 2. Remove the drip tray, water tank, and the cup holder. 3. Clean out coffee grounds or any dirt left in the unit (around the vue-cup holder and the handle) using a soft toothbrush or a similar tool. Wipe the unit with a damp cloth. 4. Hand wash all the removable parts with mild detergent and dry with a soft cloth and put everything in its place. This will keep your machine nice and clean and your coffee will taste better. if you need a replacement reservoir for your V500, you can contact Keurig Customer Service. Send them your machine’s serial number and they will help you find the correct part. Beware! The VUE system has been discontinued, and it is increasingly difficult to find the cups to use in them. They can use K-cups if you have the appropriate adaptor, but that is also difficult to find. I have one of these machines, and it is superior to the old K-cup units, but, as the VUE cups become increasingly hard to find, I’ll have to eventually stop using it. I have a v600 with a leaky water reservoir, i have found some cheap v700 reservoirs, besides the color, are they the same thing? Hi Marc, both machines are the same dimensions and water reservoir has the same capacity so I’m pretty sure the V700 reservoir will fit your V600 perfectly. But if you like, give me a day or two to check with Keurig. I will let you know as soon I get back from them. I just got an email from people at Keurig. Just like I thought, the V600 and V700 water reservoir are the same and the V700 reservoir will fit your V600 machine. I hope this helps. All the best! I just read an article about my Vue coffee maker and it talked about all the bad health things because it cannot be cleaned and the reservoir tank harbors bad microorganisms that cause serious health problems. Is this true? What can I do about this. Can it be taken apart and really cleaned? Hi Gary, don’t worry, Vue is hard/easy to clean and dangerous as any other coffee maker or home appliance. Coffee makers in general are harder to clean than French press for example, but regular cleaning will keep the germs and mold away. I recommend to do a regular cleaning routine every two weeks and to descale your machine every 3,4 months. This will keep your Vue nice and clean. For descaling you can use a special Keurig Descaling solution or white vinegar. For Vue descaling instructions, please see page 7 http://krg.bz/21Uo4RZ . This will remove all the build-ups and dirts. What about emptying the reservoir for storing? unfortunately, the inner tank cannot be drained completely for storing. It’s one of the biggest Keurig k-cup and vue machine flaws. Keurig recommends to empty the side water reservoir and store your brewer in its upright position to avoid water leakage from the inner tank. The only way to completely drain the inner tank is to disassemble the machine. I’m looking for VUE short expression coffee cups made of porcelain. I bought some years ago for my mum and I need to find them because she has broken most of them but loves them. Hi Alex, I’m not sure I know the exact cups you had, but If you’re looking for a good quality demitasse cup, I would recommend Acme brand. They are available for purchase here at Seattle Coffee Gear website: https://www.seattlecoffeegear.com/acme-demitasse-cup . I’m just not sure if they have a color that you want, but you can check with them. 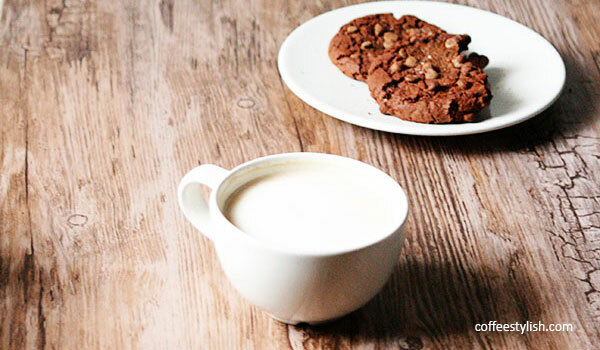 Another good choice would be Rattleware coffee house demitasse cup. I hope this helps. Do all vue machine’s make a chugging sound while brewing? How many grams of coffee do the Vue regular and travel cups hold? The K-cups apparently hold about 10 grams and I have been wondering about the difference in capacity. Hi Bruce. Regular k-cups and vue cups hold from 9 to 11.5 grams of coffee, depending on the blend. Travel mug Vue cups hold around 14 grams of coffee. How do I drain the water out of a Keurig Vue 600 for storage? after emptying the water, there is still water in the inside reserve reservoir, how do you remove this water? Hi William, unfortunately, it’s impossible to empty the internal water reservoir. The only way to do this is to disassemble the unit! It’s best to just turn the brewer off, unplug it, empty out the removable water reservoir and make sure it stays in an upright position to avoid water leakage while moving. I’m sorry. I hope this helps. Bought a veu a good coffee maker. But getting the coffee is now a hassel . Can not find coffee in stores so I would not recommended this maker. Oder on line they sent me the wrong filters. They did make it right but now going to go back to a regular coffee maker. They should not offer something that you cannot find coffee for. You can always use solofill for your own brand of coffee, this is what I plan to do, find the one that is compatible with your machine. By the way the info on the adapter was given in early 2014. Is there a way to make the coffee hotter? Hi Keith, if your brewer is at default water temperature setting (192° F) you can change the temperature. The max water temperature for the Vue is 197° F.
To set the brew temperature, select the settings icon and then select temperature option. In this new screen use + and – buttons to set the temperature (+ in this case). When done, select “SET” and you will be returned to the settings menu. That’s it. Once set, your coffee will be brewed at the selected temperature until you change it again. Hope this helps, have a great week. I’ve reset the temperature but my coffee still comes out weak and the temperature is just above tepid. I have been using the Solofill V2 for about 6 months and no issues. There are a few K-Cups that put grounds into the coffee cup but it is few and far between. It works great and opens the Vue to a whole variety of pods that can be used. The best thing about the Solofill V2 is that it has a better filter that comes with it for using regular grounds. The first filter that came out to use with the Vue to be able to use regular grounds would let a lot of sediment in the coffee cup and you would get a large amount settled in the bottom of your cup. I had to descale my Vue for the first time in about 2 years of use. I hear now that the Vue V700 is being discontinued. I bought 2 more just in case one breaks I will have backups and continue to use it for a long time. Yes the new brewer takes both but not the old vue cups work And no my K cup and it reads the lid of the k cup and ONLY Keurig brand cups will work if it cannot read the label the generic brand cups will not work Again Keurik is making it so you have to use their brand not a cheaper one or better yet your own coffee no getting around it. my old vue died I called Keurig and they send me another one free of charge. but like I said the new one is made to use only the Keurg k cups and the new vue cups. Did you check on ebay for your replacement needs for your Keurig Vue 700? Yes, I did look on ebay for just a replacement head…what I discovered is that others selling their Vue 700 had also sent in the head. I ended up buying a used Vue 700. Unhappy Customer…even with the new Keurig 2.0 you still can’t get ahold of the Vue cups? Bed, Bath, and Beyond has a large selection of them…better than any other place I have seen, other than online. So if you have a Bed, Bath, and Beyond in your area, you might want to check it out. Also, the new Keurig 2.0 uses the same cups as the Vue system. Now they are just making a little dot on them, so that you supposedly can’t go back and use older Vue cups in the new 2.0 (although, some say there are ways around that). This is true, however you can no longer buy a Keurig Vue off the shelves, I went to Ebay for mine and the solofill as well. Happy Shopping! I absolutely Love my Vue V700. The coffees are wonderful as well as the teas and other drinks. Have had this machine since it came out. Still works wonderfully and I use it every single day, in the morning. Sometimes in the afternoon as well, after work. The K cups are everywhere but the Vue packs? Not so much. They were supposed to be the next big thing and just haven’t caught on yet. Expensive when you do find them, If I had to do over, I would still stick with the Keurig brand but would probably go with a machine that used K cups instead of the Vue system simply because of the availability of the cups.Strength of cofee is better is also weaker in the Vue cups and not as hot. Karen i don’t think the Vue is going to catch on anytime soon. I bought my Vue machine over a year ago thinking the same thing and noticing the opposite to be true. Bed Bath and Beyond is no longer stocking the coffee as well as Best Buy. There has not been one new coffee brand or flavor added since i purchased mine. I believe the Vue brand will eventually be phased out. HI! We just bought the V700 and I was going to purchase the Solofill V2 reusable filter. But I have read a couple of reviews stating that the reusable filters allow grounds into the machine and damage the Vue systems. I guess it has to do with the pressurized water system of the Vue brewers. Another user below stated that Keurig was supposed to come out with a reusable filter in the fall 2013 but the don't have them on the Keurig site. Has the Solofill issue been resolved? Is there a different reusable filter that works? Thank you! yes the Solofill V2 is the only available option at this moment. They don’t yet make original Keurig filters and I doubt they will start selling them soon. I’ve noticed that people are having problems with new “improved” V2 model too, so I can’t say for sure. As you know, it’s always best to use original cups since everything else can sometimes damage your machine. But, I most Vue owners use and recommend the filter. I can only suggest to use medium to coarse coffee grind in the V2, if you decide to use it. Don’t use fine or extra fine grind for this purpose. The new v2 comes with an adapter that allows you to use k-cups. You can also use old travel size vue cup for this purpose. Save the top layer (plastic basket), get a k-cup, make a small hole at the bottom of you k-cup and place into the vue basket. Then use as vue cup. You can see the video here: http://www.youtube.com/watch?v=vHc0GJtfZ2I . As I mentioned, it’s always recommended to use original pods. But, these are also options. I hope this helps. Have a very blessed and happy holidays. HI! We just bought the V700 and I was going to purchase the Solofill V2 reusable filter. But I have read a couple of reviews stating that the reusable filters allow grounds into the machine and damage the Vue systems. I guess it has to do with the pressurized water system of the Vue brewers. Another user below stated that Keurig was supposed to come out with a reusable filter in the fall 2013 but the don’t have them on the Keurig site. Has the Solofill issue been resolved? Is there a different reusable filter that works? Thank you! I have the V2 filter and it works awesome. Just don’t fill the coffee past the line and you won’t have a problem. I have had no problems with the Solofill V2. As long as you are not trying to put an entire coffee bag in the filter, you’re fine. Makes a nice strong cup of coffee. I use a 16 oz stanless steel travel mug…perfect! I am interested in a Keurig Vue… is the 700 model the newest or is it the 500? What would you recommend? I would like to make iced lattes. To do this do you just buy espresso vue cups? I have never used a Keurig but would like to get one. Just want to make sure I can make the drinks I want and would prefer the newest/best model. Thank you!!! The vue 700 is their first model, but all models are so similar, I would probably get the 500 (newest & smallest one) because of the price. It’s a great little machine. However, the Vue machines don’t make real espresso. Just regular coffee, teas and hot chocolate. But there are some really good single serve machines (the one that use pods) that makes espresso. First, if you want Keurig, there’s Keurig Rivo System https://coffeestylish.com/keurig-rivo/ . Then there’s a really popular Starbucks Versimo https://coffeestylish.com/starbucks-verismo-review/ . They both make espresso and are really really popular. But, these are not my first choice since Rivo has just 4 espresso pods in their offer, and Starbucks pods are not very cheap $1.00 per pod (and usually you need two pods to make proper sized drink). Personally, I would check out the Nespresso or the CBTL machines. The Nespresso machines, use nespresso pods ($0.65) per pod, have huge number of different pods and several different machine models. The Nespresso makes amazing coffee so it’s a great choice as far as the drink quality. Depending on the model, you can get the Nespresso machine for $99.00 (old model), $179.00, $229.00, $249.00. For more info about their offer & machines head here http://www.nespresso-us.com/machines/ . They are also on sale on Amazon https://coffeestylish.com/nespresso . NOW I know this is probably too much information, but I want to help as much as I can. Personally, I think that the CBTL or the Nespresso machine are a good choice, but you can also check out the Rivo and Verismo. As far as the capsule machines, that make espresso, that’s about it. Or if you just want to make espresso, you can get some nice & affordable starter espresso machines https://coffeestylish.com/best-home-espresso-machine/ . They are not as convenient as pod machines, but usually they are a lot cheaper ( to buy and to make coffee). I hope this helps. Let me know if you need anything else and good luck! Thank you so much for all the information!! I am interested in the Keurig because I actually have a list of drinks I want to make (chai tea lattes, regular coffee, hot cocoa, iced lattes and teas, and sleepy time teas). I had researched the Nespresso machines and wasn’t sure if I would have that variety of drinks with that machine. I would like a machine that I can easily find the pods for and can even substitute our own coffee with in the reusable cups. I will also be honest. .. This is my Christmas present so I want the newest, coolest one out there lol. I like the Keurig Vue because of the new way the cup/pod works with the filter inside etc. But I don’t want to get one if it’s possible they will discontinue those types of machines. I’m kind of at a loss. Honestly I’m not sure about the Vue neither. I love the machine since it makes great coffee, but people are having hard time finding the pods lately. If you want more coffee options, then the K-cup machine is probably a better choice. Celestal makes all these teas in the k-cup form, the machine make regular coffee and the k-cups are available online and at grocery stores and they have huge choice of brands and blends. Now, even though you can’t make real espresso with these, they do make some really strong extra bold k-cups, which taste great and you can use them when making iced or milky drinks. Plus, you can use your own coffee, which is great. I have a Keurig Elite (k-cup model) for 4 years now, and I really love the machine. It does seem that Keurig machines are not as durable as the old ones, so that’s why I wanted to recommend something else. But there’s always customer service… But, for all the features and drinks you want to make, I guess that k-cup machine would be ideal. Keurig Platinum ($179.99) is their best K-cup model. It has a quiet brew technology, removable 72 oz water reservoir, 5 brew sizes 4, 6, 8, 10 and 12 oz, on/off timer, removable drip tray, display. And, about the Vue: they do sell pods online and you can use a reusable pod. If that’s fine and you really want that air movement feature, then Vue is definitely a better machine. V600 and v700 have larger reservoir and 8 cup sizes. The only difference is that v700 has a color touchscreen. I have a Vue 600 and I love it. Go to the Keurig website and there is a lot of Vue pods and a lot of variety. Also if you become a member you will get a discount. You can also go to Bed Ath and Beyond and they also have a large variety of Vue pods. Anyway… pretty cool machine. My only disappointment so far is that the machine defaults to 8oz size and regular (vs strong) setting. This is after *every* cup – even if the machine was never turned off. Kinda silly to me. They let you customize brew temp, on/off time, etc. So why not let me customize the default size and strength, or at least remember the last used. This means if I go to make a 2nd cup immediately after the first one, I have to remember to change size & strength else I get a bad 2nd cup. Also interesting is that you need a minimum amount of water in the tank to even start the process. So even if you want to make 1 cup, you have to fill the tank like over half full. What am I supposed to do with the extra water? Have it sit there until the next cup? Dump it out? Fortunately it doesn’t heat the entire reservior so maybe it’s okay to leave it there, but standing water is not good cause stuff can start breeding in there :( Don’t know why they did this. Maybe as an overkill to make sure it doesn’t boil dry? Hi, Nick. The water reservoir issue is probably just a safety thing. Some people don’t pay attention to these details and if the machine runs out of water too often, while brewing, this can damage a machine after some time. So, it’s not necessarily a bad thing, even though it seems annoying. As far as the cup size, well, the 8 oz cup is some standard, so I guess they had to start somewhere. But, you have some really good ideas here. :) Thanks a lot for the feedback, I appreciate it. And, happy Thanksgiving! Makes sense requiring a minimum water amount for safety. Just can’t figure out why it needs so much. Minimum is like more than 24oz even for an 8oz cup. It’s smart enough to detect cup size. So if there is enough water to make an 8oz cup, and I increase size to 12oz, it will start flashing that I need to add water. So if it’s smart enough for that, why doesn’t it require just a bit more than whatever cup size you pick? Oh well. I did call them about the default 8 oz size. They seem like a really good company – they listened and agreed that it would make sense to let the user select the default size but that this is not how it is designed. They also offered me a free box of Vue pods for the trouble :) They said the platinum plus or something like that model had selectable default size but don’t think I need that much of a machine! What is the best grind of coffee for the Vue. We are using grind 8 and it comes out thru the filter to make sludge on bottom of coffee cup. Hi Teresa, I would try the medium grind (it should look/ feel like a beach sand). Please let me know what you think and how it works for you. Thanks for stopping by and happy Thanksgiving! Can you pleas tell me how many ounces the Mr. Coffee large and small cup brews and all so the Elite?I really like the large cup size of the Mr. Coffee maker so what is the difference?Thank you for you're time. If you have a two cup size Mr.Coffee model (KG5), small cup brews 6 oz and large one 10 oz. Keurig Elite45 has 3 cup sizes: small makes 6 oz , medium 8 oz and large makes 10 oz coffee. Hey Julie, I’m sorry to hear that. You might want to check out the brew temperature setting on your machine. I think that Vue works at 192F, and you can use the setting to change like -5 +5 F. Maybe it’s not set properly. Go to “brew temperature mode” and use + and – buttons to set the temperature. Then press “menu” to save the settings. I hope this helps. If not, then you might want to call their customer service. Let me know how it went or if you need anything else. Good luck! I bought the Vue February 11th, it makes really good coffee nice and hot and strong as you can select the temperature you desire. It is nice that you can do travel mugs and select different sizes, also cool you can do iced coffee, tea.. Also the hot apple cider, hot tea, hot cocoa. The froth is a two step process and really not that great more like a dry powder milk/ cream. That was a lil disappointing but for the travel size I use and the different options are cool enough for me to keep it. I did call and ask when they will be coming out with a reusable filter for this VUE they had hoped it would be out by spring but said they had to move the date for more like fall 2013.. Kinda disappointing but as long as they do and are working on that is great, as I love the fact that VUE cups are recyclable!! I had some k cups left over, really wanted to use them as they did not fit in this machine way too small,so I did try to experiment using the travel Vue cup adding a k cup and adding an extra whole to the k cup on the side, it actually worked out well. But yesterday the February 28 my brewer stopped working, since I hadn’t had my Vue for 30 days I was able to return and get a new one, I don’t know if it was because I had experiment or just the machine but I will try this again and not experiment and just wait if I have any problems like this again then I will return and purchase something different..
yes these experiments can sometimes cause damage to our coffee makers and that’s why it’s always best to use original coffee packs. Still, since Vue is a complex coffee machine, this doesn’t have to be the main reason. But, I am really glad you got a new machine :) Thank you so much for your feedback. I am sure it will be useful to my readers. Have a great weekend! I bought the Vue a few days ago. Six weeks ago, I purchased the Nescafe Dulce Gusto Piccolo for super cheap at my local grocery store, and fell in love with its ability to make really good frothy lattes at home, but I had to measure out the water precisely for each of the two steps in the brewing process. This got annoying after a while so I was on the hunt for a new, automated system and of course Kuerig was the first one that popped into my head. I was dismayed to learn that the Kureig Platinum didn’t do “frothy” so looked at the Vue and purchased it, despite the price point. I am SORELY disappointed. Well, not with the machine in general. I love the design, the recyclable cups, and the coffee/teas it makes, but the primary reason I bought it was for the “cafe style” drinks, and it disappoints sorely compared to the Dulce Gusto. There really is no froth. At all. It seems to simply add the white powered milk to the cup, and the flavor just isn’t anywhere close to being on par with the Dulche Gusto, even the bottom of the line Piccolo that I own. I will be returning the Vue, post haste. I haven’t decided if I will buy the Kureig Platinum and keep the Piccolo for those “frothy drink moments”, or if I will buy the Dulce Gusto Creativa, which is the newest, most automated version available. The only thing holding me back is that there are only approx. 16 flavor options for the DG, vs hundreds for the Kuerig. I would consider the Vue again in the future if they make changes to the “frothing” capability, but for now, I am headed to return my Vue, and I have a decision to make on what I’m going to buy in its place. Hi, Jackie. I had a chance to try Vue and I was really satisfied with the result I got – but in comparison with regular Keurig coffee makers. At the other hand, when it comes to frothy drinks, Dolce Gusto and CBTL coffee machines are the best, so I am not surprised that you are not satisfied with the result. Especially because you usually make coffee with Dolce Gusto. I am sorry though. The fact is that this coffee maker is a Keurig version of CBTL/Dolce Guesto and it’s a good choice for all those who want to stay loyal to Keurig. Now, if I understand, you would like to make frothy espresso-like drinks at home. I don’t know if you can replace Vue with some nice espresso machine instead with Keurig Platinum. If you want to make cappuccinos and lattes for example, I doubt that Platinum will fulfill your expectations. With real espresso machine, you will be able to make real espresso based drinks. Now, you might not have that comfort like the one you have with single serve coffee makers – you will have to use ground coffee, but at least you’ll be able to drink real espresso coffees at home. Of course, you don’t need some large, professional $1000 espresso maker. You can get some small one but the one that have milk frother/steamer. You can get them for about $150.00 which is less than the price you payed for Vue. It’s just a friendly suggestion. Thanks for stopping by and for your feedback, I really appreciate it. I am trying to decide between a Vue and the original k-cup brewer. :( The My k-cup isn’t a deal breaker for me at all. The frothy drinks would be kinda cool as I’m more of a prissy coffee drink drink anyway. LOL But if that is the only difference between the 2 and the price of the k-cups may come down, then I may be swayed with the K-cup model. Still not sure though. ((Sigh)) Any help here?? This would be my first BIG coffee maker splurge so I’m a bit nervous too. I had the chance to test Vue recently, and I actually enjoyed using it. The truth is that Vue system is a lot more powerful and it does offer some really cool options. If you want an outstanding cup of coffee, this coffee maker is a great choice. However, if you want more affordable version, at this moment I would recommend buying a regular K cup coffee maker. The k cups price should drop down pretty soon and you can choose from larger number of varieties. At the bottom line, the coffee maker is a lot cheaper. Right now you can get regular Keurig Mini for about $90.00 or Mr. Coffee K cup coffee maker for only $55.00. Let me know if you have any additional questions. All the best! The REAL reason for the Vue? The patent ran out on K-cups. Keurig can no long charge coffee companies a licensing fee to make K-cups. Soon, the cost of the cups will start coming down dramatically. The Vue cups will remain pricey. I already HAVE a Keurig that has adjustable temperature, size and strength. Don’t believe the hype. Froth shouldn’t cost that much! I agree. I really want to get this machine. But I also buy organic, free trade. so disappointed they don't have a "My K-cup" style accessory for the Vue. You certainly do NOT have "full control" when you can't buy and grind your own coffee. I always buy organic fair trade coffee of my choosing and so this will keep me from purchasing this otherwise wonderful looking coffee maker. Hello Doug. You’re absolutely right! I decided to stick to my old Keurig for this same reason. I surely hope that they will make reusable vue packs as soon as possible. Will let you know! ;) Thanks for stopping by and have a great day.